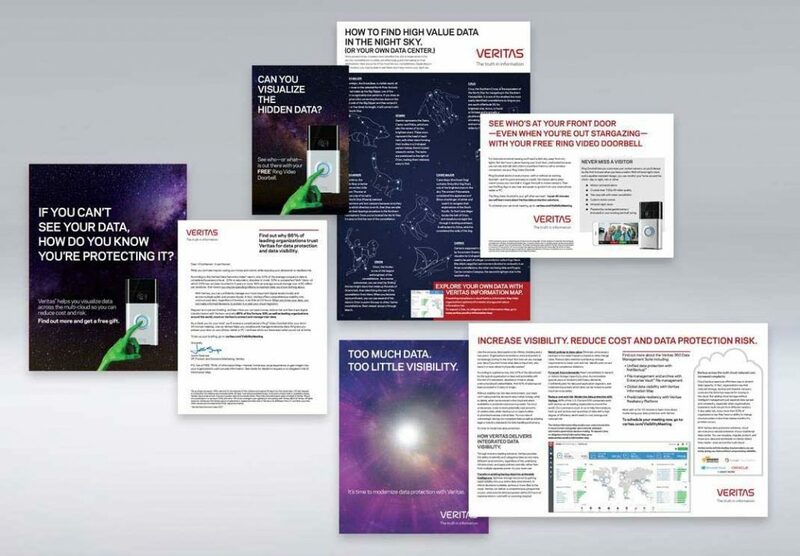 ABM Campaign for Veritas - Beasley Direct & Online Marketing, Inc.
Veritas enables organizations to harness the power of their information, with solutions that cover all platforms with backup and recovery, business continuity, software-defined storage, and information governance. This account based marketing direct mail campaign is part of a multi-touch effort, including email, direct mail, and teleprospecting. The goal is to schedule demo appointments that will be handled by Veritas sales personnel. The direct mail ABM campaign asks the targeted C-Level and IT titles the question “Can You Visualize the Hidden Data?” in their company, and answers the question on how Veritas can help them know where all of their data is. The prospect is rewarded with a very nice gift, a Ring Video Doorbell, for attending a 30-minute demo appointment with a sales rep.
Are you trying to reach C-Level and IT titles? We can create a successful ABM Meeting Maker campaign for you. Call now for a free consultation.